Act 1: Brian Wilson comes in to close the game and gives up some hits. Act 2: Bruce Bochy pulls Brian Wilson from the game fearing he’ll blow the save. Act 3. 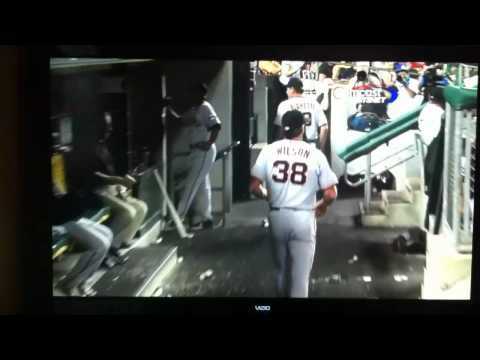 Brian Wilson goes batshit crazy in the dugout. Seems like a pretty sane dude to me. Oh, he got the win. Figures. Oh! Here’s one more via Productive Outs. Yes, he just punched a water cooler with his pitching hand. Musta been a shoutout to Khalil Greene. This entry was posted in Baseball, MLB and tagged Brian Wilson, brian wilson crazy, Giants, MLB, San Francisco Giants, Tigers, water cooler. Bookmark the permalink.